My favorite scientist and geek in the world (non-fiction) has to be Dr. Robert D. Ballard. It’s been that way since I was a kid and learned about underwater exploration, and naturally, his expeditions to the Titanic. I’d learned all I could about that disaster and looked at the pictures, watched the documentaries and even joined the Titanic Historical Society. Huh–maybe I should re-join, but I’d need to save some serious money to drop it on a membership–I still have some of their old publications. So, when I found this book on the Lusitania, one of the few rivals Titanic had for service in the transatlantic shipping lanes, I had to read it. Besides, I always like reading about things that usually only get 2 sentences in the history textbook at school. 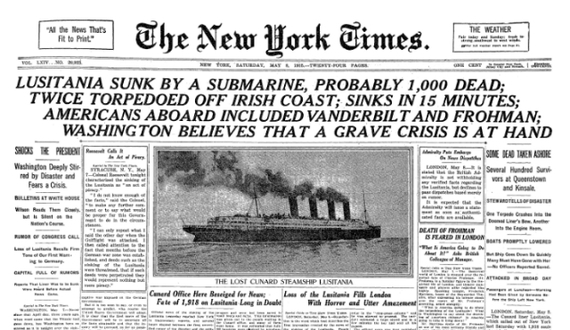 Anyway, May 1915 comes and Lusitania is on the way to her death, in spite of warnings like the one above, reported anonymous warnings given to certain passengers not to board the ship, and a captain very much set in his ways with a cruise line behind him overly confident in their ship. Exploring the Lusitania is a bit different from other ones I’ve read by Dr. Ballard, probably because the wreck had been discovered and re-discovered over the decades since the war, long before he went down to it. This is not a book about how they found it–fishermen had been snagging their nets on the wreck for so long and it sank within sight of the Irish coast; many eyewitnesses saw the explosion and saw her go down. This book is not a “first discovery” book like most others from Ballard. What is interesting is the amount of material about the past that is contained in the pages. I’m used to seeing a 50/50 shot of past and present material regarding the ship and exploration. However, this book spends maybe 75% of its pages on the Lusitania’s era. Ballard and Dunmore fill the pages with passenger recollections, some history of the hearings and testimony, the routine and days before on board the I-20 submarine that sank it, and several photos of the Lusitania’s interior. That last bit is not so surprising, perhaps, because unlike Titanic, the ship made over 200 crossings and spent many years on the seas before succumbing to them. Plenty of time for pictures. Exploring the Lusitania also tackles the controversies: the propaganda surrounding the loss of innocent civilian lives, and what made the second explosion happen (and why it was so powerful the ship went down in less than half an hour). I think the scientists that made a hypothesis about coal dust were on the right track–feel free to read, though, and draw your own conclusions. This is a time capsule in book form, a dose of past and present to help further our understanding of a sinking that–like Titanic’s–went far beyond the moment and the lives on board. This’ll be a staple on my bookshelf, probably forever.